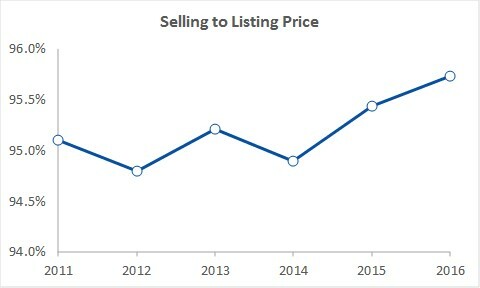 In an earlier posts I discussed how Prince Edward County detach home listings fell to a 5-year low in February and how homes were selling more quickly as a result, particularly in Picton and Wellington. If you are in the market for a County property, you will likely have to move more quickly than in the past to get the property you want. The listing shortage is also having an impact on prices. For the last 5 years, County homes sold, on average for between 95.0% and 95.5% of listing price. In the first two months of 2016 the selling to listing price ratio jumped to 95.8%, the highest in five years. If you are a prospective buyer in the County, it looks like you’ll have to be prepared to offer a little more that in the past this spring.